The 8th annual Analogue Hobbies Painting Challenge is underway! It's fun to be back at the brushes again this year, and I'm pretty excited to get going at the latest edition of the Challenge. This year we have traveled to our cabin near Sault Ste Marie, Ontario for Christmas, and I was able to bring my paints and some primed figures along with me for the express purpose of getting an early start in the Challenge. I was pleased to crank this opening submission out during a beautiful winter day at the cabin! A lovely winter day at the cabin! These are Imperial French soldiers from the War of 1870, the Franco-Prussian War. These are 28mm castings sold by "Eagles of Empire", a fairly new provider that has brought some lovely castings to a period and setting that is otherwise (compared to subjects such as WW2, Napoleonics and others) somewhat-niche-and-neglected by sculptors and figure companies. I did a debut post on my interest in this period earlier in December. 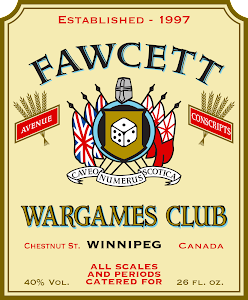 While I have a desire to play some "Black Powder" games in this period in 28mm, it will take a long time, likely at least a year, before I have enough figures gathered and painted before I can put on a game for our local group in Winnipeg. While I hope this edition of the Painting Challenge will help me reach that goal, I still don't want to wait that long for a game, so I thought some 28mm skirmish gaming in the period would be a much quicker route to getting a game going on the tabletop. So while I am using the range from Wargames Foundry for my regimental/brigade/division gaming plans, I settled quickly on the range from Eagles of Empire for skirmish gaming purposes. These castings are lovely - tricky, but lovely. The French sure seemed to carry a lot of cooking pans around in 1870...but of course! What do I mean by "tricky"? Well, as hobby types we all have our own preferences, ticks and quirks - for me, sculpting styles is one of those things. The figures from Foundry, sculpted by the Perry Brothers, have a sort of familiar and forgiving feel and shape to them. These sculpts, on the other hand, are from a very different sort of "school" of sculpting - these are tall, nearly 30mm tall, with slender builds and a more "realistic" proportion (in some ways) to them. The rifles are very narrow, the fingers very slender, etc. They do not, in my opinion, mix well at all with the figures from the Wargames Foundry range. But they will do just fine for skirmish gaming! And I just LOVE the French uniforms from this setting. Red kepis! Baggy pants! And epaullettes everywhere!! These seven figures gave me 35 points against my target of 1000 points - an opening "skirmish" in the Black Powder side duel and inspiration to keep going on this project through the Challenge. And these fellows bring me closer to the goal of running a skirmish game of some kind set in this period very soon. Those figures are lovely, Greg. Nicely done! Kind of reminds me I still have a unit of early Great War French to finish up. It's crazy to think they were still wearing essentially the same uniform in 1914. Great looking stuff Greg, with a lot more to come I am sure!